Santiago Rusinyol, or Rusiñol (1861–1931) was an amiable morphine addict now better known for his amusing writings than his pretty, decorative landscapes and genre scenes. Born into a family of wealthy textile magnates, he developed a keen interest in watercolours as a teenager, joining the Centre d'aquarelistes de Barcelona. He rented an apartment at the Moulin de la Galette in Paris with his friend Ramon Casas, where he developed the charming, ironic, bohemian persona. While briefly painting in the tonal style of Casas, he was more inspired by the French Symbolists and Puvis de Chavannes. He would later join with Casas to open Els Quatre Gats. In 1891 Rusinyol fell in love with Sitges and bought up a pair of adjacent houses overlooking the sea. He made them into his special refuge, filling them with his collections of Catalan arts and crafts, but most of all with the Catalan wrought iron he adored, the keys, locks, andirons, daggers, candle holders and knockers, which inspired the name of his home, Cau Ferrat the 'Den of Iron'(now a museum). 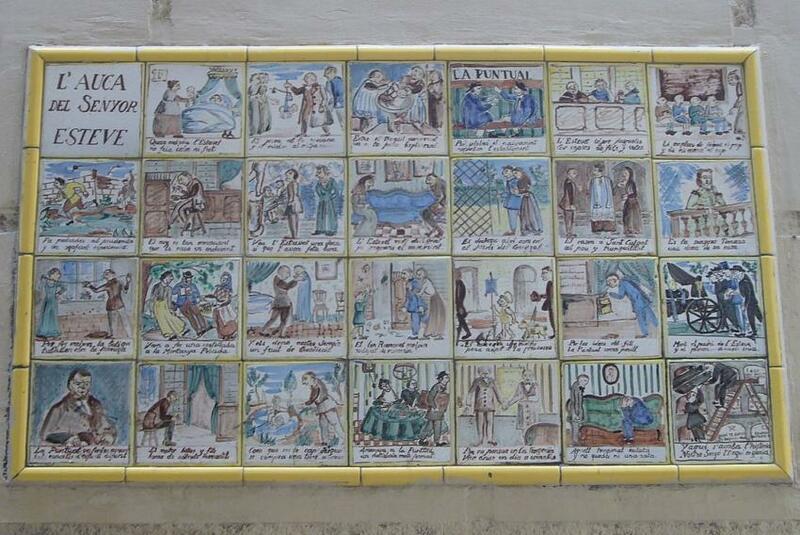 Cau Ferrat and Rusinyol formed the core of a group of genial painters inspired by the light in Sitges. Known as the Escola Luminista, the group included Joan Batlle i Amell, Felip Massó, Arcadi Mas i Fondevila, Joan Roig i Soler, Joaquim de Miró. Rusinyol wrote that their art was in search of new ways of experiencing things 'it includes whatever you can dream of, dreaming alone...' Many of their paintings do have a shimmery, dreamlike quality. Between 1892-99, Rusinyol organized Modernist Festivals in Sitges that proved so popular that special trains were put on from Barcelona. Besides art exhibitions (in 1894, the focus was on the two paintings by El Greco that Rusinyol managed to purchase, and that still hang in his house today) there were concerts and plays. 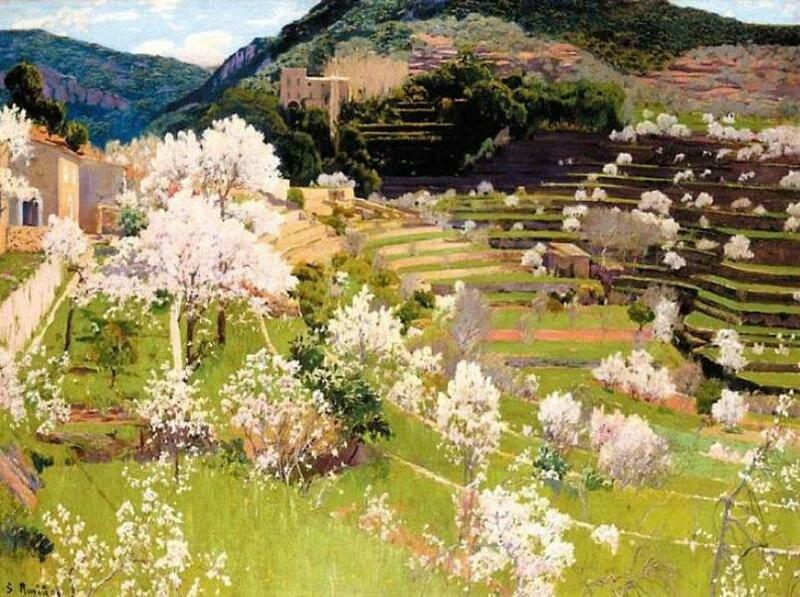 Beginning in 1896 and after a visit to Andalusia, he started to paint gardens. He published his critiques and travel writings the following year in Impresiones de Arte and went on to translate Baudelaire, and wrote some of his best books and plays, notably a book and play called L'Auca del Senyor Esteve (1907) based on the life of a typical Barcelonan shopkeeper and his son who wants to be an artist in 27 scenes, so popular that it was illustrated in tiles and posted on the wall of Carrer Petritxol in the Barri Gótic.